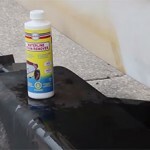 Is Algex Aluminum Bottom Cleaner safe for fiberglass? Could you please tell me if Algex is safe to use on fiberglass hulls as well as aluminum. The label is unclear in this respect and the boat that I intend to use it on is fiberglass with fairly heavy algae growth from the summer. Yes, you can safely use Algex on fiberglass but it is not as aggressive as Algae Strip Industrial or Green Genie and may take several applications with 30 to 40 minute wait times for the chemical to work to get the same results. Use Algex on your props, trim tabs, lower drive unit and other underwater metal. 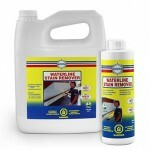 It will clean the marine growth without damaging or discoloring the metal.